A combination of drugs to treat breast cancer. 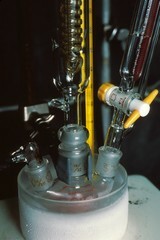 An apparatus that mixes drugs for combination chemotherapy. At times, various combinations of as many as fifteen drugs are used in the treatment of certain cancers.